Last winter I realised just how tasty brussel sprouts were in a salad. Even my son, who detests cooked sprouts, really enjoyed a salad I made for Christmas Day using raw brussel sprouts and this one is not too dissimilar to that but with the addition of kale and apple. I saw the idea for this recipe on the website of Nourished Peach but decided to use pomegranate seeds (I had one sitting in my fruit bowl) instead of radish and I left out the cheese as I was going to serve the salad with a dish which already had some cheese in it. I could have eaten the salad on its own; it was so tasty with the crunchiness of the pomegranate seeds, the crisp sharpness of the apple and the sweetness of the kale and brussel sprouts mixed with the tangy dressing. The dressing will keep in the fridge for two or three days so could be made in advance. Put all the dressing ingredients into a screw-top jar and give it a good shake to mix. Pop the walnuts into a dry fry pan and toast over a medium heat for two to three minutes until they start to turn golden brown and give off an aroma. Set aside to cool. In a large bowl, mix together the kale and brussel sprouts. Drizzle half of the dressing over and using your hands, massage well. Don’t skimp on this massage as it makes the kale beautifully sweet and tender. Add the pomegranate seeds, sliced apple and remaining dressing and pile into a serving bowl. Add the toasted walnuts. You can serve the remaining dressing separately if wished. 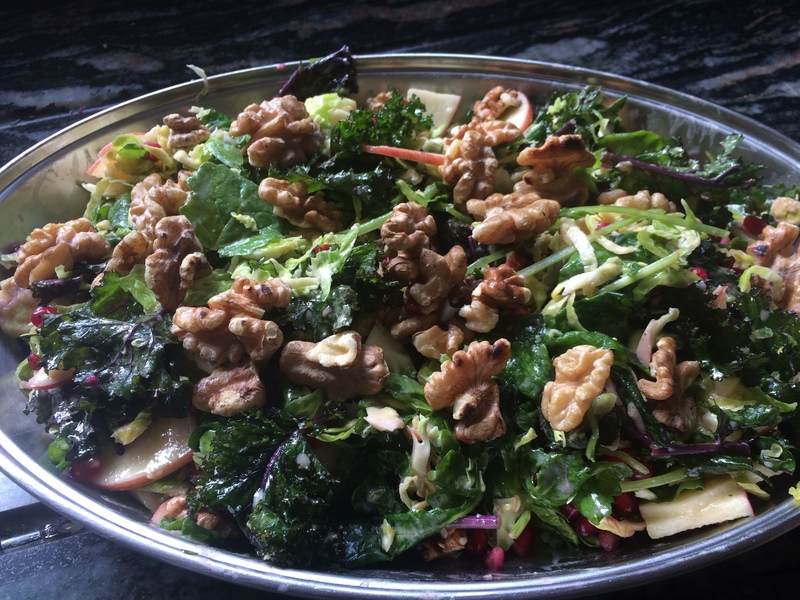 This entry was posted in Salads and tagged Apple, Brussel sprouts, Dijon Mustard, Gluten Free, Healthy Eating, Kale, Lemon Juice, Olive Oil, pomegranate, Salad, Vegetarian. Bookmark the permalink. This sounds fabulous -and likely will make it on my Christmas dinner list. Thank you.